Thea is a concept for an artificially-intelligent, on-the-go navigation assistant for the blind and visually-impaired. Using the continuous positioning abilities that 5G wireless technology will enable, Thea understands the most effective way to get around and guides users accordingly. As a system, Thea communicates granular directionality through a set of wearable haptic pads and a voice-activated user interface. By first interpreting natural speech, Thea then provides non-intrusive audio and tactile feedback. Ultimately, Thea helps people with vision impairments to overcome mobility challenges and empowers them to more confidently navigate their world. As one of the world’s largest cities, New York City lags behind other major metro areas, like Sydney and Tokyo, when it comes to accessibility. The unpredictability of public transit, constantly changing sidewalk infrastructure, and building access all pose problems that are often overlooked by the sighted community. In New York City alone, 5% of the population is blind or has a severe visual impairment—that’s roughly 350,000 people. 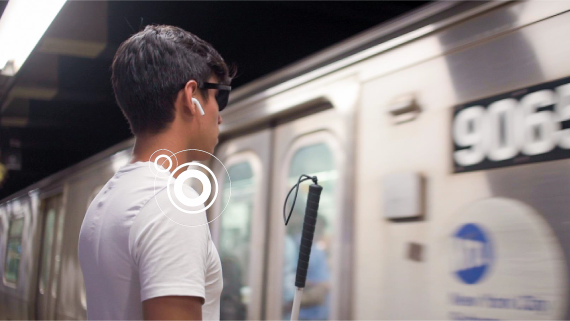 We aspired to use New York City as a hub for observational research and expanded our findings to create a scalable solution that could benefit people everywhere with vision impairments. From our research with over 60 blind and low-vision people as well as experts, we recognized a few common problems, which include pre-planning, path details, and last-foot navigation. These common pain-points helped us to define an opportunity space that explores the intersection of the vision impairment and navigation. Prior to venturing out of the house, people with vision impairments have to extensively pre-plan, which stifles spontaneity. On the way, they could encounter obstacles in their path—like major train delays or road construction—that derail their plans. These types of problems are typically easy for a sighted person to deal with, but for those with a visual impairment, they require immediate, up-to-date information that provides options for re-routing. The “last foot” in navigation is a serious challenge. For example, getting to a subway station is possible, but finding the correct platform proves difficult, especially if trains change. As a result, we created Thea, a concept that offers a comprehensive solution to help the visually impaired independently and safely explore their environments. Thea is the result of a 10-week research and development project completed by the intern team at Moment / Verizon in summer 2018.